Good to know that Microsoft gets it; the intranet is more about people and process — and teamwork — and technology is merely an enabler. And yet, for Microsoft, it is about the technology, particularly Office 365, and the crown-jewel in the ubiquitous intranet software and portal solution, SharePoint (SP). In the past, before SharePoint Online and Office 365, the latest version of SharePoint was released in one full-swoop. Now, many of the latest and greatest features in the new SharePoint, SharePoint 2019, are already available in the cloud, in SharePoint Online. Now, in the cloud, new features and upgrades are released every week. No longer do you need to wait three years between major releases. This year, the big release of SharePoint 2019 (on-premises), sometime this Fall, will be somewhat anti-climatic. Case in point: 70% of all SharePoint seats are online. And the numbers are astounding: there are 400,000 SharePoint customers; 135 million active users of SharePoint. So, most SharePoint users are already using new features today, fed by many trends in AI, mobile and social computing. Chief among the many trends driving Microsoft’s investment in SharePoint is mobility, and mobile access, and an increasingly young workforce that is attached to their mobile phone. In fact, it’s estimated that by 2025, 75% of the workforce will be millennials. That’s a lot of youngins who are used to accessing everything via their phone, and working and communicating via social tools. So, among the many, many new features in SharePoint 2019 and Office 365, is the brand new SharePoint Spaces. Needless to say, not too many companies are issuing virtual reality (VR) visors and masks to their employees. However, MS says it won’t require a VR mask and visor, and SharePoint Spaces will be accessible from any device. 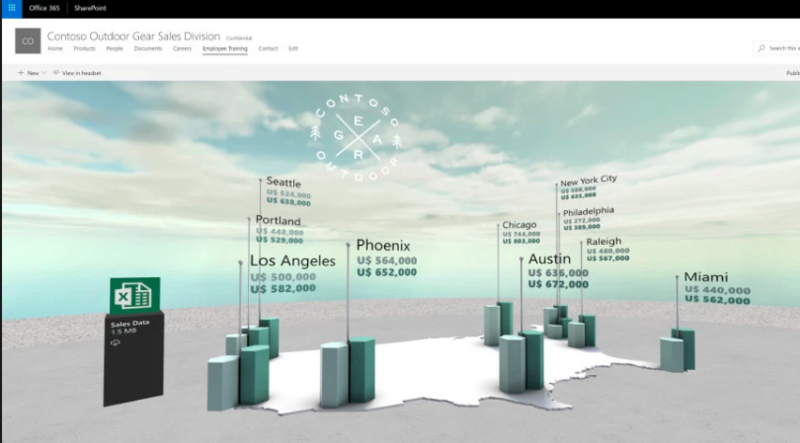 SharePoint Spaces is not yet ready for release, and the demo was underwhelming to say the least. However, at least Microsoft is straying into this space, and has built a framework that is easy-to-use and plug-and-play. It will likely be some years before a majority of companies are using virtual or “mixed reality” in the workplace, though training and new hire orientation are notable use cases. Keep in mind that a very small minority of companies are using tools like Yammer and Teams, and therefore virtual reality or mixed reality spaces are even farther away from reaching a tipping point in the corporate environment. Further to the mobile trend, and to better support all those millennials that need to access the intranet via their phone, MS is soon releasing a new SharePoint app that is in preview release right now. It looks fantastic, and one is left to believe that MS has finally figured out mobile computing (anyone remember the first mobile-friendly SharePoint 2010?). Outside of the app, SharePoint has a new, clean mobile experience – greatly enhanced over the mobile experience in SharePoint 2016. Another big, major improvement to SharePoint is the new user experience (UX) design and general usability of SharePoint. It is noticeably superior to previous versions of SP. It’s very clean and modern, with a major emphasis on images, and video. “SharePoint 2019 has the most UX (improvements) than we’ve ever delivered before in a SharePoint release,” Hani Loza, of the Microsoft SharePoint team. 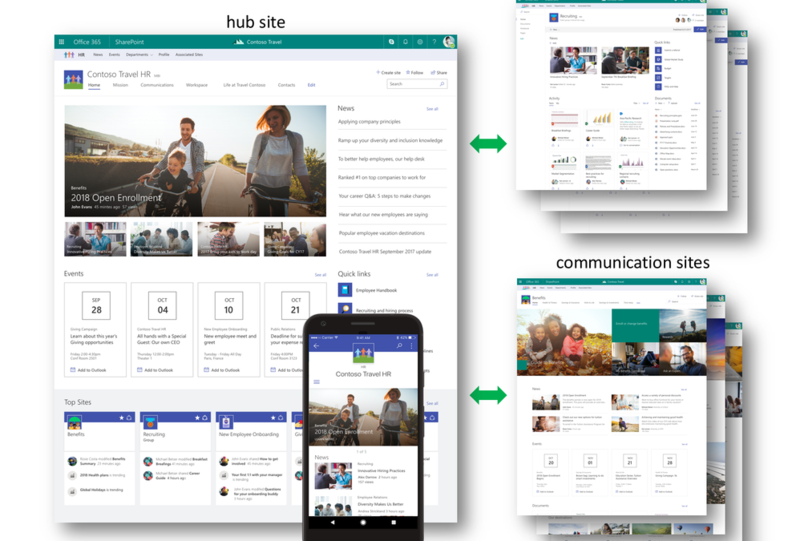 Among the new UX features, particularly noticeable in the new SharePoint Communications Sites, are drag-and-drop web parts for image galleries, slideshows, hero slideshow, and video. Speaking of tagging, the new meta data and columns features are impressive — really impressive. The new “modern list experience” comes with new columns with colouring and shading, new meta data, workflow even custom columns for custom data sets like “Effort” (how many days associated with a project). The columns now also have new filters. Here’s an overdue improvement: hero slide and image carousels also finally have link capability so now the picture will actually link to a content page. “Teams are working really well together. And you can now better connect and integrate content regardless where it rests within Office 365,” says Mark Kashman, Senior Product Manager at Microsoft. Project Server 2019 is another addition: a flexible, scalable project and portfolio management solution that enables efficient and effective management across portfolios, programs and projects, team collaboration from anywhere, and insights to make informed business decisions. It includes time-based reporting and tracking. Search is already pretty powerful in Office 365, but here additional improvements have been made which allows the user to customize their search results, enhanced by new UX features including an enhanced ‘preview’ for results. Another nice UX feature is the ability to allow or deny people editing of a file right from the Share pop-up box. So contrary to predictions about the death of on-premise SharePoint, it’s not going anywhere. Hence the soon to be released, SharePoint Server 2019. Coming this Fall.